A new review paper from SPPI and CO2 Science finds "that as the air's CO2 content rises, grassland plants will likely exhibit enhanced rates of photosynthesis and biomass production that will not be diminished by any global warming that might occur concurrently. In fact, if the ambient air temperature does rise, the growth-promoting effects of atmospheric CO2 enrichment will likely rise right along with it, becoming more and more robust in agreement with the experimental observations reviewed by Idso and Idso (1994)." As the atmosphere's CO2 concentration continues to rise, most plants tend to exhibit increased rates of photosynthesis and biomass production, including those of various grassland ecosystems. This increase in productivity should increase the amount of forage available for grazing animals and possibly reduce the land area occupied by bare soil in certain environments. However, some people claim that global warming will negate the growth-promoting effects of atmospheric CO2 enrichment and actually stimulate the opposite process of desertification. 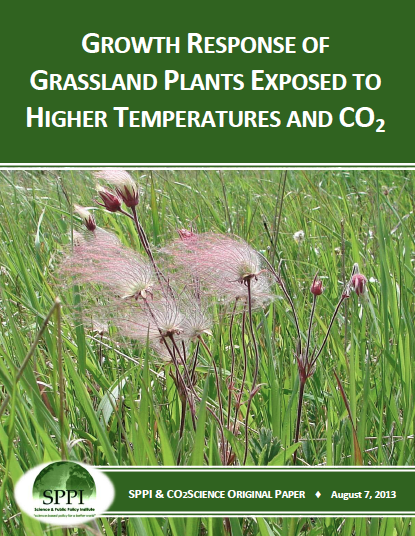 This summary thus seeks to develop an answer to this important question by reviewing published scientific studies of the photosynthetic and growth responses of grassland plants to atmospheric CO2 enrichment when exposed to higher-than-normal temperatures. In conclusion, the recent scientific literature continues to indicate that as the air's CO2 content rises, grassland plants will likely exhibit enhanced rates of photosynthesis and biomass production that will not be diminished by any global warming that might occur concurrently. In fact, if the ambient air temperature does rise, the growth-promoting effects of atmospheric CO2 enrichment will likely rise right along with it, becoming more and more robust in agreement with the experimental observations reviewed by Idso and Idso (1994). The future ability of grasslands to produce increasingly greater amounts of forage, and perhaps reclaim areas of barren ground in certain environments, thus looks promising indeed, as long as the air's CO2 content continues to rise.